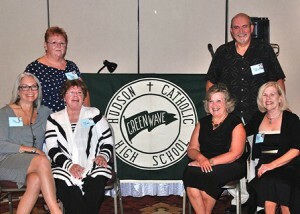 Hudson – Although the building that housed Hudson Catholic High (HCH) was recently demolished, its school spirit continued as the class of 1965 celebrated a 50-year reunion weekend Sept. 25 to 27. They were the sixth class to graduate from HCH and the fourth to include boys. The majority of them also attended grades one through eight together at St. Michael’s School (SMS), the next-door building that was recently razed. Among those 12-year alumni is Larry Letendre, the reunion committee co-chair. They’ve also interacted at several reunions. Classmates have previously gathered at the Hudson-Concord Elks Lodge 959 for five-, 10-, 15-, 25- and 35-year reunions. Each of the first four reunions drew over 40 of the 75 classmates. Their 35-year reunion was held jointly with the Hudson High School class of 1965. There are more upbeat memories of their 25-year reunion when Letendre and Nancy Kelly Burbank performed a comedic sketch. Other than two lay teachers, all of the HCH faculty at the time were Sisters of Notre Dame de Namur. That’s another topic of their reunion conversations. Another memory of the 25-year reunion for them was seeing their classmate Eddie Ginnetti. His band performed at the Saturday night Town Hall dances while they were in high school. The 50-year reunion weekend began with a casual get-together Friday evening at the Horseshoe Pub in Hudson. 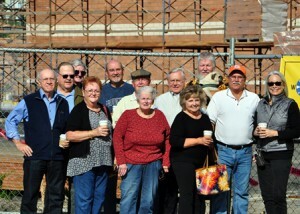 Classmates met Saturday morning where HCH was formerly located, now a construction site for Rite Aid and Marlborough Savings Bank. That evening, 38 classmates gathered with 22 guests at Best Western Royal Plaza Hotel in Marlborough. Joining them were three of their SMS classmates, who began at HCH and graduated elsewhere. Travelling the farthest was Mike Bourque of Texas. Thirteen classmates are deceased. The reunion planning committee also included Barbara Jagling Richards, co-chair; Nancy Kelly Burbank and Mary Conley Lamburn, memorial board; Joyce Tarbell, greeter; Carol Cennedella Quinn, class photo mailings; and Anne Ordway Wifholm; table decorations. Letendre now lives in Georgia and was among out-of-town classmates who followed their alma maters’ demolitions on Facebook. Classmates returned to the Best Western for Sunday brunch to continue reminiscing and create new memories. “We’ve always felt like a real family,” Letendre said.